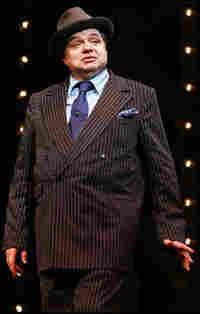 Good Old Reliable Oliver Platt In 'Guys And Dolls' Actor Oliver Platt takes the stage in the latest revival of the legendary musical Guys and Dolls. Platt tells NPR that modern audiences can still relate to his classic character: Good Old Reliable Nathan Detroit. 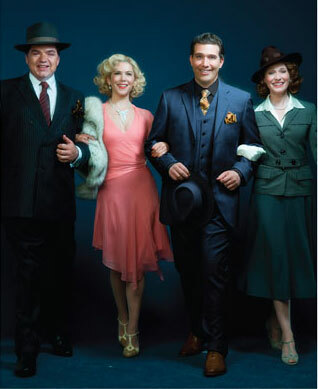 Oliver Platt (from left), Lauren Graham, Craig Bierko and Kate Jennings Grant are the guys and dolls. Oliver Platt made his name in Hollywood in films such as Flatliners and Frost/Nixon, and on TV series like Nip/Tuck. Now he stars in a revival of one of America's best-loved Broadway musicals, Guys and Dolls. Platt steps into the shoes of Nathan Detroit, the fast-talking, down-on-his-luck gambler who runs the oldest established permanent floating crap game in New York. In doing so, he joins a slate of luminaries who have played the part, including Nathan Lane, Robert Guillaume and Frank Sinatra. Platt tells NPR's Michele Norris that he took on the role "with a strange mixture of terror and delight." But Platt has avoided watching how other actors portrayed Detroit, "because stuff can sneak in even when you don't know it's happening." Based on the work of legendary writer Damon Runyon, Guys and Dolls has wound its way into Platt's everyday life. He says that since joining the cast, his speech often takes on a "Runyonesque" quality. "The use of the present tense, the sensationally endless run-on sentences with all the dependent clauses. ... I just marvel at how influential this guy was, and he wasn't even a New Yorker," Platt notes. The actor says it's important to stay true to the material and not try to improvise or add on to what is already a great work of art. 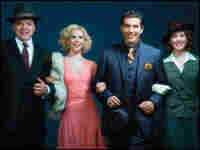 At its heart, Guys and Dolls is the story of a "classic American" trying to work. "This is a guy, they won't take his marker anymore ... they won't take his check," Platt says. It's a story that's very relevant today, he says, noting that "there are a lot of people like that now in New York City and this country."